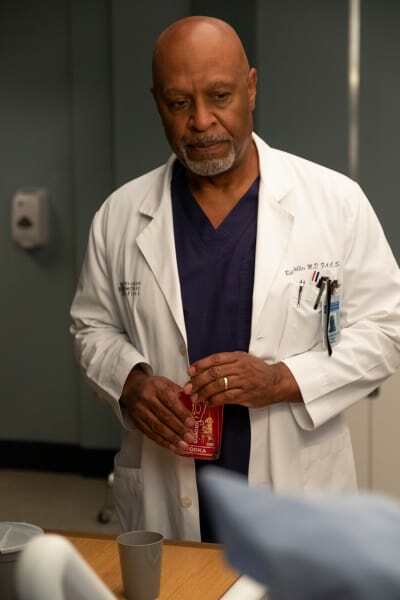 Grey’s Anatomy Recap: Is Catherine Dying?! 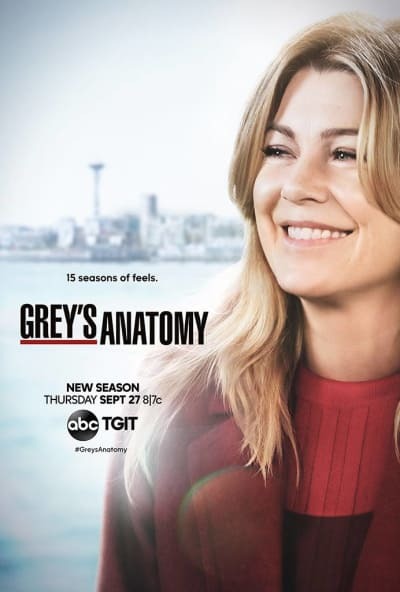 Thursday’s episode of Grey’s Anatomy featured the return of Catherine Fox who was out of town dealing with her foundation and a health crisis. It also featured her husband, Richard at his darkest moment yet, and some relationship drama for that pesky ‘ship that is Jaggie. 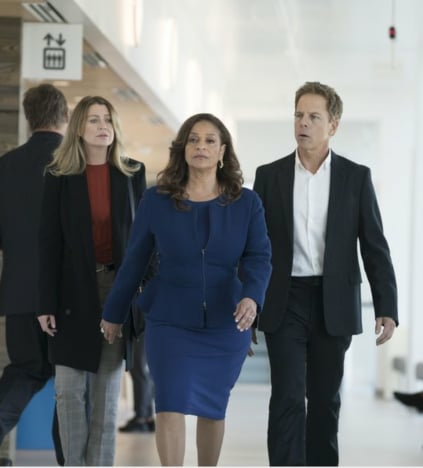 At the top of the hour, Meredith and Koracick were whisked off to L.A. with the aim of helping Catherine who summoned them to help out with a patient. Once at the building Mer and Kor (It has a certain ring to it, right?!) were ordered to room with technology that you would expect in a futuristic movie. They noticed a tumor in the vascular and nerve domains, and when the two surgeons wanted to know who the patient was, Catherine confirmed it was her. It was a stunning twist. But Catherine didn’t want to be taken away from the ribbon cutting of the building, so she was adamant about business as usual. The three went out for drinks, and while Catherine wanted to know whether her prognosis was grim, the doctors had no answers until results returned. She went on to say that she couldn’t tell anything to Richard. “I don’t know if he can handle this,” she said, which explained why she text Richard at the top of the hour to say she was spending more time in Los Angeles. Later, as the ribbon cutting kicked off, Koracick admitted to Meredith that Catherine was suffering from cancer, and he was scared that he could not save her. “I have no idea how remove it without paralyzing her or killing her,” he said with a sad look on his face. 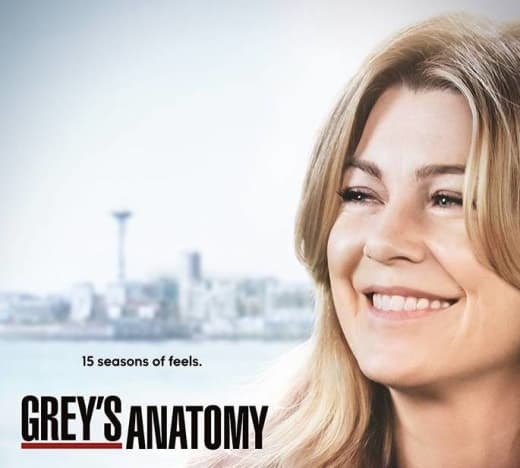 Grey’s really wasn’t lying with its “15 seasons of feels” promotional efforts. As for Richard, he was going through some struggles of his own. Hell, he’s been spiraling since his sponsor died last season. At the hospital, Nurse Frankie had some major complications with her pregnancy. After stabilizing her, she died in the O.R., and it left Richard in a horrifying situation. He went to the bar and talked about his sobriety. The barman poured him multiple shots of vodka, and let him have at it. But this was not the type of support Richard was looking for, so he trashed the bar and found himself in jail. How far will he spiral after his wife’s cancer diagnosis? As for Jaggie, things took an awkward turn when Maggie noticed a woman was texting him and learned that her knight in shining armor was romancing other women. Well, he got close with another woman while having his crisis of faith. This rubbed Maggie the wrong way, and she took it as him sleeping with other women. Maggie claimed she thought she would be the reason their relationship fizzled out, and Jackson countered that she was the first one to run in any given situation. Jackson went on to say that he was made he and April had the crisis of faith at different times, and that was enough for Maggie to call the time of death on the relationship. Joe Giudice: Sexting Teresa Giudice From Behind Bars? !